Give your pipe a light. Or have yourself a merry little Christmas now. There is no better time of year than Christmas! The time of Christmas, or “festivus” as some might say, is all about family, sacrifice, and warm feelings. And while we are tough, us pipe smoker still yearn for this warm and cozy feeling the holidays bring. In order to fulfill this intrinsic relational need, Cornell & Diehl developed a Christmas blend; one that was intended to give us the feeling that we are around those we are closest to in life. This blend, Golden Days of Yore, is an excellent symphony of flavor, texture, emotion, and love. Inspired by the carol “Have yourself a Merry little Christmas”, this innovating tobacco combines multiple leaves and an array of ingredients that make up the sauce, each acting like a note in its own respective carol. Made in the Carolina’s, and blended with the love and care that only C & D can offer, this is a tobacco that you need to stock up on. Cause once Christmas is over, I have a feeling it will get more and more difficult to find this blend. It would be unfair to say that C & D used to have ugly tin art. Luckily for us, over the past year or so, they have revamped their design process. The art on this tin is a perfect modern motif of the young tobacco smoker, looking for that deep attachment to their hobby. The image of a smoking Santa carrying a sack of presents over the hilltop above a small town is absolutely perfect. This tin just entices the onlooker to buy a tin and see what has been stewing inside. Just as a home cooked Christmas meal has about a thousand different ingredients, Golden Days of Yore is no simple blend. This blend is composed of red and bright Virginia’s, Orientals, Black Cavendish, Dark Fired Kentucky, and Katerini. A fantastic new aspect of tobacco production, this video from C & D actually explains how they make the sauce, made up of rum, allspice, cinnamon, chocolate, and more, that forms the warm flavors of this blend. Even though there are multiple ingredients in this blend, the tin note is not overly complicated. It smells of hay, a little smoke, and a touch of cinnamon and allspice. I want to say that I could pick out all the other ingredients as well, but I believe just knowing what it was made up of tricked my mind into smelling them. The issue I took up with this blend was the cut. It was very inconsistent, bulky, and hard to pack. The taste of this blend is much more powerful than the tin note led on. The Orientals and Katerini tobacco were easily noticeable to me, while the taste from the spiced sauce made my mouth taste like a holiday candle (this is a good thing). The biggest problem I had when smoking was just keeping that stuff lit! I would clench the pipe, constantly puffing for about 75% of the bowl, and every time it would go out about half way through. While I am disappointed with that, I am not scared. This seems to be a specific issue, and others have had it as well, and they will fix cut. Other than that, this tobacco was a very cool smoker, especially for an aromatic blend. It was easy to smoke, even in the summer, and went well just about every time of the day. All in all, I do not believe the room note is that bad with this blend. Even though it is an aromatic, it still has the makeup of a not so sweet blend. My wife, the room note expert, told me that this blend smells like you tossed a bag of potpourri on a campfire. While she was slightly joking, I think there is some truth to that. A holiday spiced tobacco combined with Orientals and DFK tobacco, it probably did smell surprisingly similar to that! There is going to be a small issue with my suggested pairing. I smoked this blend in the summer, when it was released. So I paired mine with an IPA, because the bodies of the two matched well, and the IPA is perfect for summertime smoking. But, this blend is supposed to be smoked in the late fall and winter. So with that in mind, I cannot suggest a drink to pair with Golden Days of Yore based off taste; I can only suggest one based off of theme. For this reason I would suggest a spiked egg nog. I feel that the spirit of drinking egg nog and of smoking this blend align well. This blend is a more bold aromatic than most, but is rather tame based on the ingredients. Golden Days of Yore is a mild/medium blend. With room for strength, but definitely a legitimate flavor base present, this blend has to be given a mild/medium rating. Another one of the issues I had with Golden Days of Yore is that it took quite a while for me to warm up to it and enjoy it, at least four bowls. I don’t know if it was because I was aggravated at the fact that it kept going out, or the flavors were just odd, but it took time for me to like this blend. I give Golden Days of Yore a score of 6 out of 10. What I would love to see is how the flavors in the sauce react with this blend after about five years in the cellar. 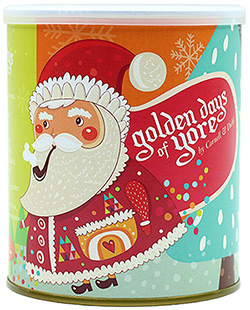 Pick up your 2oz or 8oz tin of Golden Days of Yore today before they are all gone!